I think it’s beautiful! Just a reminder that the final two chapters of the book also have illustrations by CLAMP. The book will be released on September 29. It totally has the CLAMP touch to it. It is gorgeous. this looks weird =_=….but CLAMP did a great job as always! You think =O I actually like it! Wow, even with the slightly more realistic style it still screams CLAMP. They’re so talented…I love them!!! Gorgeous work. :wonders about the elf character: Yay purple eyes. The obi says (I think): Asano Atsuko’s writings: The gods, on a whim, a little kindness. “Utatane” apparently means “nap.” “Light sleep” sounds a lot better, though, even if it’s not the exact same meaning. Oh, one more thing! Thank you for translating the obi, and thank you to Chibiyuuto for posting this! I love CLAMP’s illustrations for this series. You’re welcome! I’m not sure if “utatane” means nap in this case, though, since I don’t see the kanji for “neru” up there. Not an expert, though! 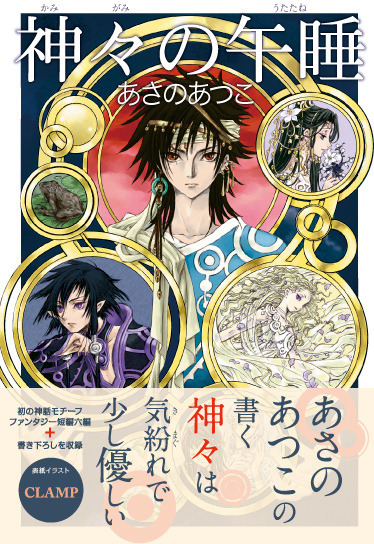 (I still think that CLAMP should release an artbook of all their novel illustrations someday). It’s a beautiful cover indeed! I like the character design a lot too, but that’s not by CLAMP, is it? I wonder if Gate 7 will have pics like this. where do you find this picture?thanks! So Clampy yet so different, I loved the style… Sometimes I want that they make something with a different drawing lioke this one. Absolutely Gorgeous, loved this cover. WOW!! It’s GORGEOUS!!! I Love the blond girl!!! !